I've been wanting to do some testing of various diffusion techniques for quite awhile now and have finally got around to doing it. The methods I've tested below are by no means the only ways to go about diffusing light. I have yet another technique to test after I receive the material (which should be next week). I tested these diffusing techniques with bicycle headlights in mind. For cycling use, users are generally looking for wide flood combined with some good throw (i.e. a good diffusion technique should widen and brighten the flood without losing tons of throw in the process). I performed my testing using a typical unmodded MagicShine 808E Clone (the typical "Cree Bike Light" you have seen all over Ebay for years) using an SMO reflector and a 39mm glass lens. I figured many cyclists could relate to this style of light. The light I used is a cool white XM-L which pulls 0.75A from the 2S2P battery pack on high (expect slightly less than 1.5A at the emitter). Note that I also have an O.P. reflector for this light which fits rather sloppy, but it showed very little beam pattern difference from the SMO. My light is a 3-mode (H-L-Strobe) with which I took lux readings on both high and low but only took beamshots on high. The luxmeter I used is the lux meter built into my rebranded Mastech DMM. I don't know that the readings mean much other than being relative to each other. I did NOT take throw measurements with the luxmeter. I also kept the batteries in my 2S2P battery pack nearly fully charged for all photos (lights were only on long enough to take the photo). The lenses I used during the testing were 39mm from DX (purchased from DX Soul - the expedited US shipping site). I did NOT test each bare lens before applying the diffusion technique (in retrospect I guess I should have done so). The DX lens did test better than the original glass lens which came with my light (i.e. less light loss). Captions are shown above the photo they pertain to. If my photos do not show up, they can be viewed here. The "Lightly Frosted" and "Heavily Frosted" refer to the use of Krylon Glass Frosting Spray. I recently shared a mod of a 4AA Rayovac lantern on which I used glass frosting spray to dramatically improve the beam (see that thread for before and after photos). The "Wide Angle Lens" is this one purchased from Action LED Lights. According to an MTBR post by Jim Harger of Action LED, the wide angle lens is made of "optical grade polycarbonate" and "clear as glass". I got the idea to try the DC Fix on the upper one-third of the glass from this MTBR thread. The DC Fix is the "sand" type available here or from sellers on CPF and BLF. Ok, it wasn't so complicated. As you can see I used a bathroom which has no windows and allows me a room of complete darkness to measure in. The light remained mounted at the same location for each measurement. I would hold the meter in my hand, leaving the bottom on the table and point it toward the center of the beam (I would actually rock it slightly until I had the highest reading). The table is exactly 6 feet below the ceiling. Just look how washed out those leaves look with the cool white light compared to this one! 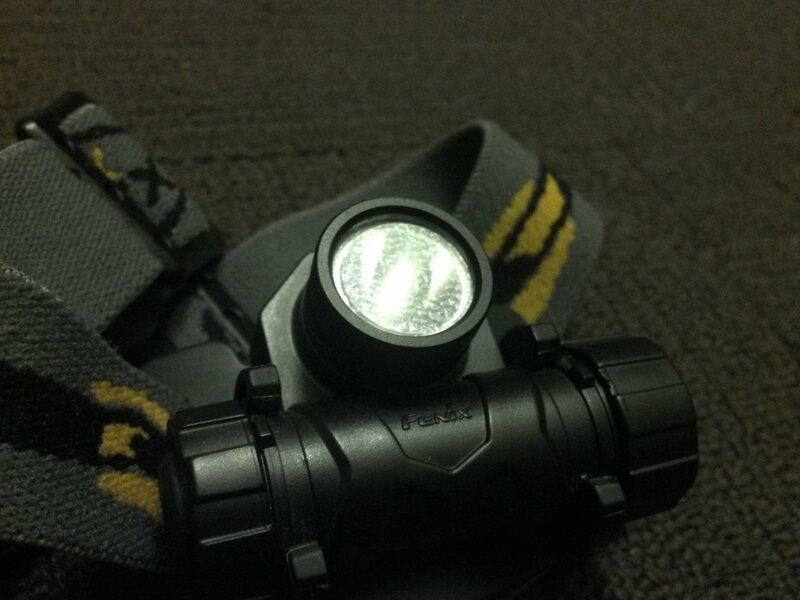 siata94 asked me (back in March I believe) about the amount of throw from my mule headlamp, so I decided to show it here. Perhaps a dual or triple XM-L/2 light with one or two mules and one or two left for throw would be a good combination. This brings up a good point; I was testing how to change (diffuse) beam patterns on a single emitter light. The next step (which I acquired lenses for but don't think I will have to time to complete) would be to diffuse some of the output from a multi-emitter light. I have a SolarStorm X3 (3 emitter side by side) with which I had contemplated diffusing the outer two lenses on. For my intended use on MTB trails with lots of switchbacks, looks like the wide angle lens is clearly the winner here with DCFix a distant second. Imo. Wow! That is a lot of work. Thank you for sharing. Just out of curiosity.. Which one do you prefer for biking. Thanks gb. Amazing effort. Which lens do you prefer or is one better than another in different circumstances? For example does riding the trails need a different lens to riding on the street? Nice work Garry! I am also a fan of Glad Press n Seal stuff. Works great for me, and also diffuses into not a perfect circle but kind of a slight oval. I then like to orient that longer axis parallel with the ground in my vision so I get a wider throwy area and nice surrounding flood. How about a light frosting ontop of the wide lens? Garry what pen did you use to write, it looks good. Also nice calligraphy. I've only been on my bike 3 times in 2014 and none of those times was in the dark with a light. (And 2 of those times were slow gentle family rides.) I would expect a light that gives wide flood while still having good throw to cover most needs. MTBers generally also wear a throwy headlamp for looking ahead / around corners. That's not something I've tried yet. I think that wide angle lens can be cut down. You could also experiment with magnifying lens sheet. I thought about throwing in the Glad Press-n-seal too. Maybe in the future. Sorry, I don't want to ruin my wide angle lens by trying frosting on it. The pen used is my favorite - Pilot G2 Gel. I think that one is the 0.7 thickness. I've never been told I had good handwriting. Useful info for me. I also rarely ride, but to me the wide angle lens looks like the best forward beam pattern. It’s too bad that it sacrifices some spill, but the column of light it sends forward on the ground seems to be unlike any of the others! So the wide angle lens is smooth on the front and ridged on the back? And the mounting area around the edges is a uniform thickness which is less than the overall thickness of the ridges? BTW-Looks like my photos are going to disappear again! I'm going to hit my PhotoBucket bandwidth limit very soon. Sorry. I'm going to have to look into another image hosting service I guess. At least you have the link to my gallery in the O.P. Try Google. Haven’t run into limitations yet for the free service. Thanks for sharing Garry . Good job . Wide Angle Lens 49 15 91% ..."
I especially like the percentages style of comparison . I wish to see more of this . Thanks. You know, I believe someone has tested DC Fix as having very little light loss. Not sure why I'm seeing so much loss in my test. Perhaps the light is cast so much to the side that it's not picked up in my ceiling bounce reading? Thoughts anyone? Yeah , I've heard about the supposedly small losses from DC-Fix , but I can't use it on my bike lights , as it definitely takes virtually all throw away . I need some throw when I'm going fast so that I don't outdrive my light . For this reason , I only use DC-Fix on lights I will use for close up work . I use Glad Press n’ seal and it does what i want it to do. Hmm . . . sounds like I need to test another method . Thanks. You know, I believe someone has tested DC Fix as having very little light loss. Not sure why I’m seeing so much loss in my test. Perhaps the light is cast so much to the side that it’s not picked up in my ceiling bounce reading? Thoughts anyone? Ceiling bounce tests are known to favor throwy lights over floody lights, even when they put out the same amount of lumens. It’s a poor substitute for an integrating sphere. Using a light box, I tested DC-Fix before/after on the exact same light (for a few lights) and got a loss of anywhere from 2% to 7%. Usually about 2% to 5%, unless I get the film dirty while cutting or applying it. A loss of 26% is almost certainly a measurement error, not an actual loss of that much light. As for throw, it definitely kills the lux… but that’s kind of the point. I usually see the lux drop to about a third of its original value. Thanks for chiming in ToyKeeper; thought you'd be a good one to speak out on it. I’d found the post by Selfbuilt on CPF, his test showed 3.2% loss with DC Fix Sand. Is there a DC Fix that has ribs rather than random? I'd found the post by Selfbuilt on CPF, 3.2% loss with DC Fix Sand. I thought it was about 3% loss. Interesting. I wonder if anyone has already tried it. Let us know how it does when/if you get it. NightSpy, are you thinking straight ribs (DC Fix Stripes) or some other pattern? To me, it looks like DC Fix is the clear winner. I don’t know… I give the DC-Fix and the diffusion lens similar ratings depending on what you are after. For tail lights, definitely DC-Fix (or aspheric or modified aspheric), for distance and close-up, the diffusion lens is a serious contender.